Would a cupcake make your Monday a little better? What about the moistest chocolate cupcake in the world with a pillow of cream cheese frosting? 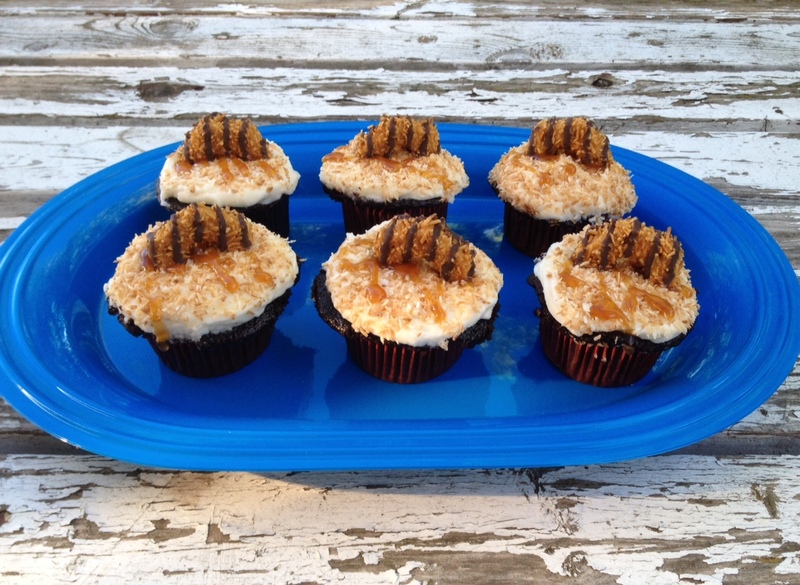 What if that cream cheese frosting was coated in savory toasted coconut and drizzled with caramel? And what if I really take things to another level and jam a cookie on top? I bet if you had one of these right now you’d start to dislike Monday a little less. In fact, you’d probably feel like you could face almost anything head on with one of these under your belt (or in your stomach). A sugar rush will do that for a person. It may be Monday, but every day we’re here is another reason to celebrate. Preheat oven to 350 degrees. Line standard cupcake tins with liners and set aside. Stir together the dry ingredients in the bowl of your stand mixer or a large bowl. Whisk together the wet ingredients in a medium bowl. Add the wet ingredients to the dry and beat on medium speed for 2 minutes. Scrape down the sides of the bowl and beat again for another 20 seconds or so. The batter will be thin. Fill the liners in the tin with batter, filling almost 2/3 of the way full. Bake for 18-20 minutes or until the center of each cupcake is set. Let the cupcakes cool in the pans for about 20 minutes and then turn them out of the pans and let them finish cooling on wire racks while you make the frosting. Whip the butter and cream cheese together for a few minutes until blended and smooth. Add the vanilla and mix well. Beat in the powdered sugar on low speed, one cup at a time until frosting is sweet enough and has a stiff enough consistency to frost. You may not need the last one or two cups of powdered sugar. Once the right amount of sugar is added, whip it at a high speed for a few more minutes until light and fluffy. Put the toasted coconut into a bowl. Frost each cupcake and then press the tops down into the bowl of coconut. 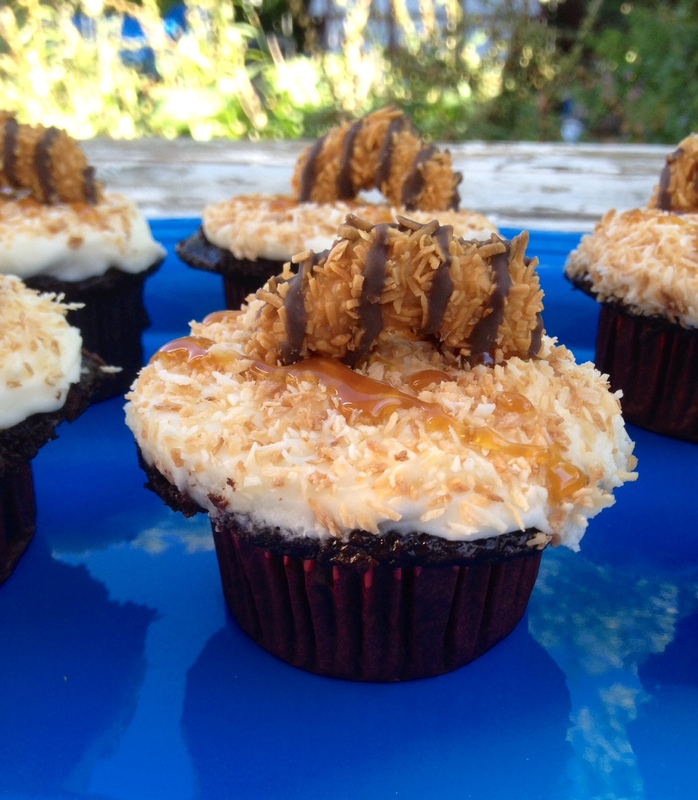 Once all of the cupcakes are frosted and dipped in coconut, drizzle each with caramel sauce and press half a Samoa cookie into each. Keep these cupcakes refrigerated until an hour or so before serving if you can. I like to add the cookies right before serving so they don’t get soggy. To toast your own coconut, spread unsweetened, shredded coconut on a baking sheet and bake for 10 minutes at 350 degrees, stirring a couple of times throughout. Watch it closely to make sure it doesn’t burn. Cool before using. To make your own buttermilk, put 1 tbsp. white vinegar or lemon juice in the bottom of a measuring cup and fill the rest with your desired quantity of milk. Stir and wait a few minutes. Voila!